October 1929 is well known for the massive stock market crash that ended the month. But that crash is also known to historians as the crisis point of a broader failing economic situation that would leave thousands on the edge of destitution even before the events of Black Thursday. During that month, some, as had many before them in hard times, turned to the Army as a means to ensure a bed and three meals per day for their own survival. No doubt, these lean times saw more than one "old soldier" return to barracks looking for a position in the ranks. It is likely these circumstances that brought Edward Howe Collinson to the Regiment's recruiter in Kingston, Ontario on the 17th day of October 1929. Collinson was born at Lutterworth, Leicestershire, England on the 1st of December in 1898. In late 1929, at the age of 30, he would have stood apart from his fellow recruits in The Royal Canadian Regiment, perhaps not so much for his age, but certainly for the medals he wore. Edward Howe Collinson was now 13149 Private Edward Howe Collinson, MC, of The RCR. While little is known about Collinson's Regimental service, we do have some evidence of the remainder of his military career through entries in the London Gazette. On 1 July 1915, Edward Howe Collinson, a Cadet of the Officers Training Corps was appointed to the rank of Second Lieutenant (on probation) in the 4th Battalion, East Surrey Regiment. He was subsequently appointed to the Special Reserve of Officers for The East Surrey Regiment in February 1916. At some point in the following years, while holding the rank of Temporary Lieutenant and serving in the Machine Gun Corps, Collinson was awarded the Military Cross. The award was gazetted on 3 June 1918 [the KIng's Birthday Honours list]. There is no further mention of Collinson in the Gazette until 1925, when he was granted a short service commission in the Royal Air Force with seniority of 7th July 1925 as a Pilot Officer (on probation). His terms of service placed him on the active list for five years. In February 1926, he was again Gazetted when his new rank of Pilot Officer was confirmed as effective 7 January 1926. Once again, in 1927 Collinson was promoted, to the rank of Pilot Officer, on 7 February 1927. His final appearance in the record shows him resigning his short service commission on 31 October 1927, only two and one-half years into the five-year term of service. We can only surmise what opportunities or fate brought Edward Howe Collinson to Canada, or what his fortunes may have been in the few years leading up to his appearance before a recruiter in Kingston on that day in October 1929. We do know that he reported his trade simply as "soldier" and that he had previously served in the East Surrey Regiment and the Royal Air force. He even stated his rank was that of Major in the Army but his Air Force rank was not recorded at the time. He also declared the medals and awards he had received from his prior service: the Military Cross, the British War Medal, and the Victory Medal. 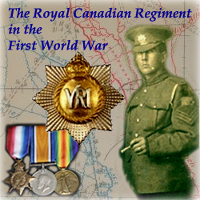 Collinson served with The Royal Canadian Regiment from 17 October 1929 until he was discharged on 5 May 1934. 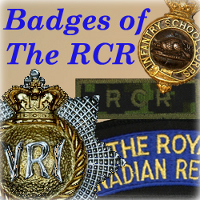 Four and one-half years as a soldier of The RCR, certainly a different set of experiences from that of a field officer in the Great War and a Flying Officer of the Royal Air Force. Apparently he neither distinguished himself in the ranks, nor was found to be lacking in critical skills. On his discharge, still at the rank of private, his character was assessed as "Fair". The reason for his discharge was recorded simply as "his services no longer being required." Collinson declared "Torisbrooke, Helensburgh, Dunbartonshire, Scotland" to be his intended place of residence after discharge. Our search for traces of Edward Howe Collinson returns to the London Gazette for two more entries. In May 1943, he is reported as being promoted to the rank of Second Lieutenant (from Cadet) in the Pioneer Corps. Ignominiously, his final showing is less that impressive: "Capt. E. H. COLLINSON, M.C. (120166) is dismissed the Service by sentence of a Field General Court-Martial", effective 24th Feb. 1945. Thus lies before us the varied career path of Edward Howe Collinson, East Surrey Regiment, Machine Gun Corps, Royal Air Force, Royal Canadian Regiment, Pioneer Corps. From being awarded the Military Cross in the trenches of the Great War, to being a pilot in the early days of the RAF, to marching as a soldier in The RCR to rejoining as a junior officer of the Second World War and thence cashiered. We may never know the details of Collinson's life and fortunes that carried him through these events, but we do know one thing, he was a Royal Canadian. And I would suspect that he was the only soldier of The RCR who was both a winner of the Military Cross and a qualified military pilot before he joined the Regiment.